The SCIEX clinical diagnostic portfolio includes an FDA-cleared assay for in vitro diagnostic use, mass spectrometers and fully integrated LC-MS/MS systems with easy to learn, intuitive software. 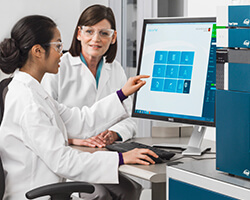 With our Global Support Services and Educational Knowledge Center you now have everything you need to maximize productivity in your clinical lab. Learn more about the advantages and benefits of using LC-MS/MS in your clinical lab. You need to deliver reliable and timely patient test results under challenging regulatory and financial pressures. 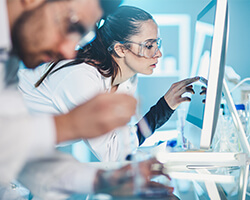 LC-MS/MS systems offer the perfect solution and the gold standard for accuracy, but those available to clinical labs have been highly complex with significant barriers to adoption. Now there is a solution. SCIEX offers robust, sensitive and fully functional mass spec solutions, with smart sophisticated software designed for multiple levels of experience. With SCIEX, diagnostic laboratories can expect maximum uptime and benefit from over 40 years’ experience in tandem mass spec innovation. Our affordable benchtop platforms offer high sensitivity, low detection limits and high specificity, leading to better data than alternative testing methods, allowing you to support clinicians with confident results. 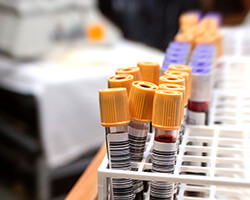 Mass spec has been at the forefront of clinical biomarker discovery for years. Many of those biomarkers have gone on to become routine clinical diagnostic assays used in testing patient samples around the world. Clinicians are utilizing mass spec for assays including Vitamin D testing, endocrinology, therapeutic drug monitoring and toxicology screening, with leading edge research in validating new biomarkers that will serve as the future of clinical testing. Discover what mass spec can do across a host of clinical diagnostic and research applications. Now you can find out about diagnostic mass spectrometry, understand how to integrate SCIEX products into your laboratory and learn how to use them successfully. We have thousands of members using our Knowledge Center who develop their knowledge in the latest mass spec innovations and benefit from continuing education credits.